la vie DIY: Skinny Crop Refashion! Happiness is shopping in your own closet. That's what I'm trying to do this year- instead of buying anything new (unless I get it for free!) I'm trying to shop my own closet + second hand to create new clothes from something old. Aside from the obvious financial benefits from refashioning, it also reduces waste, is fun + will help you build sewing skills (if you're a beginner), so you should get on board! 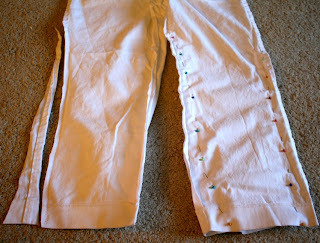 I made these skinny white crops from a pair of Express baggy cropped pants in my closet. I didn't like the way they looked before, they were loose and made me look stumpy. I took a "before" pic, but I can't find it? It'll have to be added in later. Really, this is a refashion that I've done before but this time I used a different fabric and actually took fabric from both sides instead of one. If you want a quick explanation, take a look at the above picture. I put them on inside out and pinned where the excess material was (it helps to have a friend for this), too them off and used a zigzag stitch (usually I use a straight stitch, but this worked, too), trimmed the excess and wore them! HERE IS A LINK if you want more in depth directions. Finished! I really, really love them. I haven't worn these in years, but now they seem like a staple! I have another pair in black that need to join these ones in a skinny refashion. So easy! Just so you know, that flowing tee was a shirt made for this blog as well- if you want to make your own, click HERE. Full week coming your way as we move into August! I plan on doing the marriage series next week (2-3 posts at the most) and will sneak in a few easy projects as well. I don't know why I bother using the word "easy" ... everything at 'la vie' is easy, or it doesn't get done! Have a great weekend, people! All the best and as always, thanks for reading!